Have you ever wondered why when fashions change with the season you see a lot of the same colors at a clothing store or home decor store and those same colors seem to be everywhere? If you think it's because those colors are suddenly "in-style" by some magical arrangement of molecules, think again. The group think behind the styles in colors comes from, you guessed it -- a group! The Color Marketing Group is the first big player in the color forecasting world. An international association for color design professionals, the Color Marketing Group creates color forecast information for professionals who design and market color. The Pantone Color Institute is the leader in color tools. They bills themselves as, ". . .the world-renowned authority on color and provider of color systems and leading technology for the selection and accurate communication of color across a variety of industries. The PANTONE® Name is known worldwide as the standard language for color communication from designer to manufacturer to retailer to customer." I first used Pantone color systems when I painted billboards years ago. Design agencies would give me color numbers that cooresponded to a fan deck (or "book") of color swatches that were referred to as PMS (Pantone Matching System) colors. Both the Color Marketing Group and Pantone Color Institute influence the colors used by manufacturers in industries across the board, including apparel, housewares, interior design, automobiles, and others. Don't think these groups are solely dictating color trends. They run a fine line between researching which colors are currently being used and then predicting which colors will be in use 1-2 even 5 years in the future. The people that think about color for industry application all the time usually have titles like: Color Forecaster, Color Stylist, Director of Color, etc. These people belong to groups that observe color use and social trends in the areas their customers (the manufacturers) sell to so that they can help the manufacturer create products in colors that people will buy. Of course -- there is always an appetite for something that bucks the trend, so every color movement has it's corollary opposite. An example is the Eco color palettes vs. the Black-and-White color trend. Keeping up on these trends is a full time job and often results in articles targeted for specific industries. The Paint & Decorating Retailer, an industry periodical published by the Paint & Decorating Retailers Association, explores product trends for the Paints and Coatings industry. 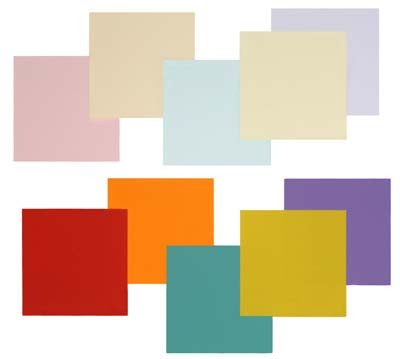 They are a great resource for color trends in the paint market. Trends in color are a result of the cultural/societal trends. Regardless of those trends, the colors you love and are drawn towards may merge with or oppose current color trends. So, pick and choose what you enjoy from the color trends and add in those colors that are close to your heart regardless of fashion. You'll be happier with your choices. 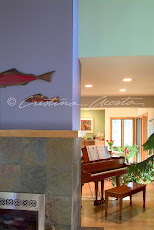 If you're looking to add color to your home, take a look at my Project Portfolio page for ideas. If you want some help to push the colors you love into a workable color palette, contact me and request my Free PDF E-Booklet detailing my color consulting service. (Put the words "Free PDF E-Booklet" in the comments box and I'll send you a link. I am just starting to paint, at the ripe age of 44. The only thing I really know about myself as an artist is that I love bright colors, and I have a creative, "whimsical" bent. I also love the fluid acrylics. I recently purchased your book, "Paint Happy" and it has become my new best friend. Your paintings inspire me and awe me. I could get lost in them. I have already learned so much from you. However, I have one stumbling block -- the pastels. I am not sure how to use them. You mention using them interchangeably with the paint, and finishing off the painting with the pastels, but I am unsure of how to do that ... do I just swirl them around? Also, would pastel pencils work in place of the regular pastels? (I don't have a studio, so I try to keep mess to a minimum). If you have anything I could read about using pastels with painting, or could share some tips with me, I would be so grateful. Thanks for being you, and for teaching me how to Paint Happy! Thanks so much for letting me know how much you've enjoyed and benefited from my book, Paint Happy! I'm always pleased to learn that my work has affected people positively. You can use pencil pastels or colored pencils. I use hard pastels (they are similar to the consistency of a Conte Crayon) because they don't leave much dust and they have a fine point so I can have control over the line. You can use hard or soft pastels, colored pencils or markers over watercolor or acrylic painting. If you ever decide to try oil painting, you'll want to switch to oil pastels so that the materials will be compatible. So -- keep working on your art. I'd love to post a painting or yours when you get something done that you'd like to share. Send me a jpeg photo that is no bigger than 800 pixels in either direction. My long tradition of personal frugality has inspired all sorts of creative ways to get high-end interior design style into my life. 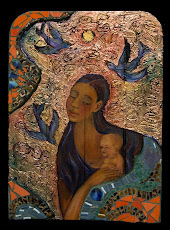 During the early years of my art career, I worked hard making ceramic tiles or painting for this or that art exhibit or whatever was going on. About 10 years into the process I noticed that I lived in a boring house that didn't reflect me at all. At the time, I was painting tiles then shipping them to ta-ta addresses in Beverly Hills and Vero Beach. I was a go-to girl for high end interior designers and shipping my art work to addresses all over the country, meanwhile none of the creativity I so easily gave to others was part of my life. I needed to revamp my thinking. I remembered the axiom, "the cobblers children have no shoes," and decided to change my ways. I made a vow to lavish my creativity on my own life, not just on others. It took a while to get into the practice of being generous with myself, but it worked. I started by painting a set of ceramic dishes for myself; tiled the stair risers with my daughter's help; painted the house; and framed and hung paintings and photos. I got my husband and daughter in on the home decor work and we re-did everything. Together we made mosaic lamps, mirrors and flower pots; painted floor mats; built garden art, and whatever I could think of. All of these years later, our house looks great! Here's an easy way for you to start bringing your creativity into your home. There are three things you can do to immediately change the mood of your house -- Color, color and color! The obvious way to bring in color is with wall paint. Another way is with fabrics. Think about all of the textiles you have in your home. Bed sheets, fabric lampshades, rugs, curtains and most any textile can slip into a dye bath. Dyeing fabrics is fun and surprisingly easy. If you can follow the recipe on the back of a brownie mix box, you can dye fabrics. My favorite fabric dye and supply catalog company is Dharma Trading Co. Not only does Dharma Trading Co have hundreds of supplies including fabric dyes and fabric paints, they also have a big selection of "blanks" or plain items of clothing or fabric yardage you can dye or paint. On top of that, The Dharma Trading Co. catalog has great directions! The front of the catalog has all sorts of useful info about the fabric dyes and how to use them. 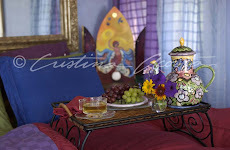 The stack of sheets in this photo shows you the great collection of colors I created for my bedding. I shop at Ross or TJ Max (discount retailers) for bargain cotton sheets with a high thread count and create great looking bed sheets for a fraction of the interior design prices. So . 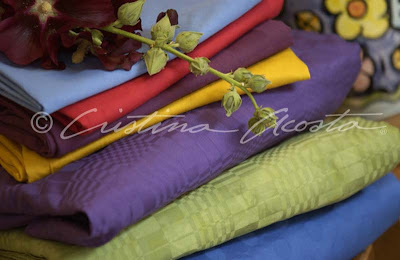 . . take the plunge into color and start dyeing fabrics. Not only will you save money on home decor, you're going to love the results! 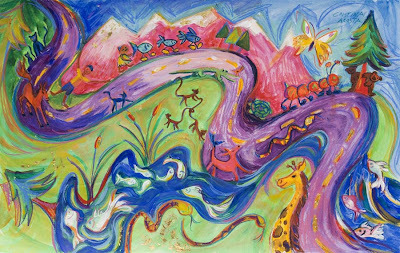 I create my Paint Happy series with a combination of artist acrylic paints and hard pastels. I've been working on switching this series into oil paint. What a learning curve! In my work, technique follows concept, so switching mediums yet keeping the vibe the same is an interesting process. And it's hard. So what's motivating this change? 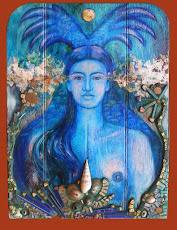 I often need to ship work to exhibits or to clients who have purchased a piece. Fuel costs have pushed up shipping costs, making shipping glass very expensive. Plexiglass is a workable substitute, but not uv protective to the work. Also, in areas where there is a lot of light reflection in a home, glass-covered art is harder to see. I'm enjoying the challenge of changing my process. 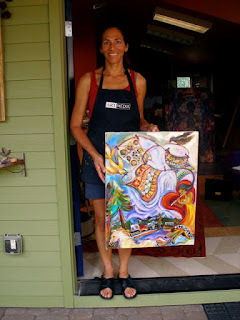 I just finished this piece and had my daughter take this photo of me holding the painting in the doorway of my studio. 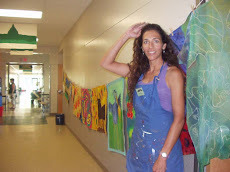 The oil painting represents the Sisters Quilt Festival in Sisters, Oregon. 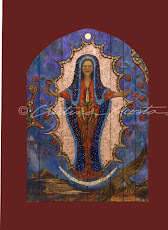 The original oil will be available through High Desert Gallery in Sisters, Oregon. See more of my painting styles on my website. I read your article on artisan breads using a natural yeast starter. I have made breads for a long time using the Active Dry yeast and I am trying to make a starter, but it seems to die every couple weeks. I use the Fleischmann's Active Dry to make the starter and it seems to be okay for the first 3 or 4 times I bake. Near the end it starts to leaven sluggishly. By the 5th or 6th loaf, it doesn't leaven at all. What I do is I have about 2 cups of it total in the fridge. When I want to use it I take it out of the fridge and leave it for ~12 hours. I use 1 cup in my bread and I save 1 cup to continue the starter. I add 3/4 c distilled water + 3/4 c flour to the starter and shake it and loosely cover it. 4 hours later, I put it back in the fridge. Then I leave it for a week, until the next weekend. Is there something that is wrong w/ my methods? Your starter looks so successful; I don't know what is going on. I think the problem stems from your sourdough starter being created predominantly with a hybrid commercial yeast. For example, in nature (without the intervention of humankind) I've never seen a forest of all one kind of tree. The healthy forest of centuries old contains a variety of plants and animals that live harmoniously (or more specifically, symbiotically) together. Your commercial starter is in a sense, a Christmas tree farm compared to the old growth forest of a natural starter often referred to as Sourdough or Pain Levain. Here's a line from Wikipedia that gives a little insight into your challenge. The text within parenthesis is mine. "The flour-water mixture can also be inoculated from a previously maintained culture. (A natural sourdough or levain culture that you buy or get from a baker.) The culture is stable due to its ability to prevent colonization by other yeasts and bacteria as a result of its acidity and other anti-bacterial agents. As a result, many sourdough bread varieties tend to be relatively resistant to spoilage and mold. Because you begun with a commercial starter it does not include a natural relationship between a yeast and lactobacillus thus, it does not have the resilience and stability of a natural yeast starter. Since you're obviously excited about the process of making artisan bread, either find a home baker willing to give you some starter, or buy sourdough starter from King Arthur Flour company or other type of reputable baking supply company. It's a simple process to rejuvenate the starter and then to make the bread, though by the length of the artisan sourdough bread recipe on my website, it looks a lot more complicated! I had to make a detailed yeast bread recipe that explained the concepts behind the choices of ingredients and techniques. Artisan natural yeast bread baking is actually far more simple than it is presented to be. Think about it, for centuries most bread was made by a village specialist or by the homemaker. These people did not usually have the resources to use high-tech measurements and temperature readings, and most people were illiterate then. They told time by the sun and had few dishes, yet the bread could be masterful. A book I've enjoyed about the history of sourdough is World Sourdough's From Antiquity, by Ed Wood details his story as a botanist who did a project for National Geographic where he investigated the natural yeast baking process that the Egyptians used to feed the workers who built the pyramids. So . . . have fun with a natural yeast bread starter and let me know how it's working. Send me a photo of you with your bread loaves. Read more about my ideas for varying your bread recipe including making Chocolate Bread and more. Check out my list of recipes for everything from my favorite Key Lime Squares to the perfect mexican salsa recipes on my website. Living close to nature is always interesting. My family and I enjoy the amusing dramas of feisty hummingbirds buzzing each other for dominion over the bird feeder (hey guys -- there are 4 feeding stations - learn to share)! Or, the beauty of young fawns in the spring with their mothers, and much more. There is a downside to all of this nature loving -- and this morning, it's a big stink. Our dog, an intrepid and energetic Rat Terrier named Chelsea finally found the skunk den in the rocks behind our home. 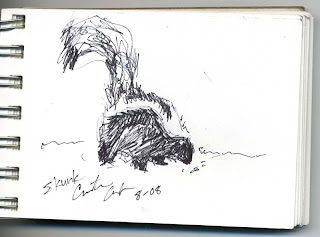 Just a few nights ago we saw the skunk happily grazing birdseed under the bird feeders. Like a cow, it moved it's head slowly side to side as it munched for at least an hour, oblivious to the yard light illuminating the area and the sound of our dog barking like crazy inside the house. Chelsea and the skunk have stayed out each other's way for the past 10 years, but that detente is over. The dog got cocky this morning and now everything stinks -- the dog, the sofa she ran to, the bed, the house -- the smell is everywhere. So -- we are on the 2nd bath for the dog -- a mixture of hydrogen peroxide, detergent and baking soda. Her next rinse will be tomato juice. My husband is roasting coffee in the oven to get rid of the scent in the house. This may take awhile. What plant tolerates drought, loves water, is generally deer and rabbit proof, and grows most places without much effort, AND you can eat it? Mint! And, even better, mint plants are available in varieties including chocolate mint, peppermint and spearmint (among the 2 dozen or so varieties of mint, many of which are available as seed or plants in most plant nurseries). Save money and ask a gardener for a few stalks and you can grow mint from a cutting by rooting it in water for a few weeks. So grow some mint and you'll soon have an abundant harvest that will make you feel lavish. Make tea, mix the mint into food or scent a bathtub. Mint is easy to dry. Though I do have a food dehydrator, I live in a dry climate so I usually dry the mint outside. 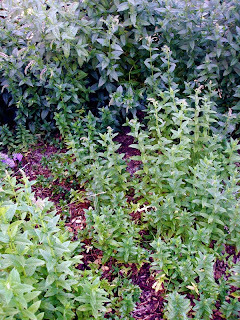 Here are some photos from my garden that will show you what to expect when drying mint. Hose the mint down (while it's in the ground) to be sure it's clean. Let it dry. Clip the plant stalks at the bottom -- a few inches from the ground. Spread the stalks across a clean window screen propped across 2 chairs. Turn the mint during the day. Don't let the mint get rained on or otherwise wet. 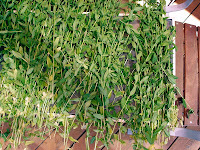 When dry, run your hand down the stalk from the tip to remove dry leaves. Discard stems. Save the leaves on a platter and let them dry again for at least the day. Put mint leaves in baggies or glass jars and store in a dark, cool cupboard. Dry mint will be crackly and easily crush to powder under your fingers. 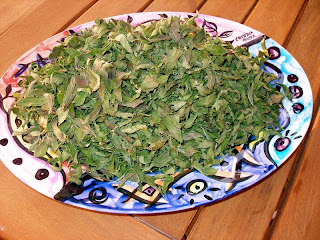 Uses for fresh or dried mint: The strength of flavor varies between varieties, so I did not include amounts. Taste as you add mint to your food. Tea, potatoes, lamb, carrots, yogurt, ice cream, chocolate, oranges and other citrus fruits, salsa, vegetables. If you love the flavor of fresh mint during the off-season, chop it and freeze it into ice cubes. As it thaws it will subtly flavor the beverage while looking gorgeous. You can also add the mint ice cubes to vegetable water (great with peas) or soups. Bury a few fresh mint stalks in a couple cups of white sugar for a few days to flavor the sugar. Remove the mint so it won't decay. Save more money and follow my recipe to make your own bath scrub using mint. 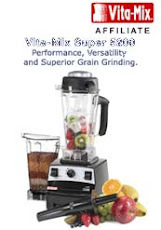 Try this and other recipes on my website. I'm learning to Standup Paddle Surf and I am obsessed! I started learning to surf last summer and because I live inland, I focus on Stand Up Paddling so that I can be on my board whether I'm on the coast or in the middle of the country. I get scared a bit in the ocean or on big lakes when the wind is high, but I keep on learning. So why am I writing you about surfing in an art newsletter? Because I'm excited to share my experience. 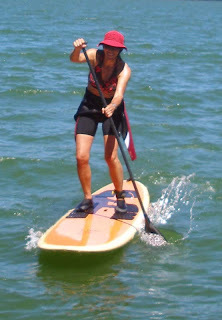 ( I love it so much my husband, Randall Barna and I have a SUP website and blog selling gear and sharing stories & tips.) Pushing myself to continue to grow maximizes my creativity. And, it's fun to be consumed by something fun and playful. My sense of possibility is enriched with every small triumph. And nurturing my sense of possibilities gives me the vision and enthusiasm to embrace life and try new things, both in my work and life. Embracing life means embracing change. One of my favorite changes to be part of is a happy wedding. Recently commissioned by a couple to paint an image to celebrate their upcoming wedding, I painted this image in my Paint Happy style. I titled it Wedding Promise. The colors, clothing and setting are personal to the couple. He's supporting the heart they embrace together as they float happily over the sea of life. I enjoy painting commissions that celebrate anniversaries and other happy occasions -- everyone is in such a great mood! I began writing professionally a few years ago, and I'm really enjoying it. I was invited to write a biographical piece for the magazine Pure Inspiration's Summer 2008 issue. Titled, Art and Spirit, I share my story of how my art has shaped the path of my life and both echoed and lead my spiritual growth. One of the results of my journey has been to realize my dedication to make my life more artful, leading me to developing design work such as Color Consulting for homes and other buildings along with developing recipes. I've included recipes for you that will help you save some money (a great thing in this economy), whether you're making a Brown Sugar Body Scrub or learning to make your own Artisan Bread so you can leave high-priced bakeries behind and enjoy the quality of artisan baking along with the satisfaction of making your own bread. If you'd like to know more about my Color Consulting work, contact me, mention color consulting e-booklet in the comments box and I'll send you a free e-booklet about my service. I hope you enjoy the remainder of the summer. Please give me some advice. I am building a one-level secondary school in an Amerindian village in the interior of Guyana. I've finally received the money to put the roof on this 70'x 40' concrete building and I need color ideas. I am planning to purchase royal blue metal roofing material. What color should I paint the school to coordinate with the roof. I am also planning to build two small dormitories, two staff houses and a kitchen/cafeteria. Do these buildings need the same color roof? I would really appreciate it if you could give me some suggestions. I checked your website Siparuta Mission Academy and noticed that the school is in a tropical jungle near a river. 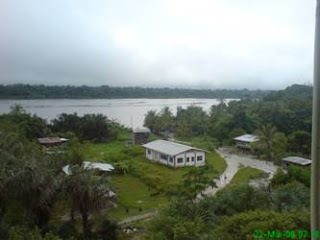 According to your website: "Siparuta Mission Academy was opened September 10, 2007 with 43 students in the Amerindian village of Siparuta, Guyana, South America. The school was an answer to the prayers of Amerindians who longed for a secondary school for their children." I checked Wikipedia about the country of Guyana, and got an idea of the weather. I can understand why you are attracted to the royal blue color for the metal roofing. The landscape of the area is so unrelentingly green that a strong cool blue is a welcome accent. It also is the color of the school uniforms. As much as I love the cobalt color, I'm concerned that in a tropical setting the darker blue of the metal roofing will create too much heat in the rooms it shelters because the darker color absorbs more UV energy. A local metal roofing company salesperson I called said that yes, darker colors on roofs do absorb more heat and that if you are in a climate where cooling is more of a challenge than heating, a lighter colored metal roof would be better. So....here's my advice: If heat is a problem, choose a light color like light blue or yellow or even an orange (if the village people would enjoy it). Stay away from green -- there is more than enough of that color already. If heat isn't a problem (or is a small problem), go with the cobalt metal roof color, it's gorgeous. I looked at the aerial view (or hillside view) of the village on your website and I think that making the metal roofs the same color would unify the compound. If that is not enough variety for your community members, at the least, make the buildings of a similar type have the same color roof. (i.e. "public" bldgs. vs. dormitories, etc.) I helped my local Habitat for Humanity with a hamlet of 10 homes and recommended that with the variety of home exterior wall colors, all of the roofs be the same color. It was very visually successful. For a general color palette I would include the cobalt on doors or any other trim area if you don't use it on the metal roof. Looking at the photos of your village area I don't see much paint (yet), mostly natural wood and concrete colors. You are surrounded with so much green in the landscape that cobalt, deep yellow, deep purple, red, bright pink, and orange are good accent colors. Take your cues from the population you are working with as I'm sure they have preferences. The wall colors can be more fun. Sometimes in tropical climates people prefer white or very soft yellow/white walls so that insects are visible. White of course can get dirty easily. 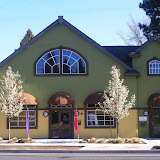 A compromise is to use mid-value or darker colors on the bottom part of the buildings -- like a band of color that rises about 3 to 5 feet from the ground, then white or other light color above that. On the outside, a mid-value to darker color part way up the wall will look better when rain splatters mud on the sides of the building. I urge you to have fun with the color scheme and include members of the village in the process. A vibrant, happy and welcoming looking compound is the first step to welcoming visitors, encouraging newcomers and giving your local population a sense of ownership and community. Another idea is to incorporate Shade Sails into your compound. Shade Sails come in many colors and even the dark colors (the navy blue is close to the color you like) hold up well in the tropical sun. They are easy (with a crew) to install and you can get immediate shelter that is modern, colorful, stylish and very affordable. Read my blog posting about Shade Sails. Send photos, I'd love to post the results and hear about the project. See my color design portfolio on my website. Our daughter is an Epee fencer and our family enjoys traveling together to her events. A typical event includes thousands of people in a convention center. Athletes of all ages mix throughout the room. There is always something interesting to see. Eppe fencing bouts are fast, so it's not easy to draw the athletes. Mostly I draw them in defensive "waiting/thinking" postures. I look for movement that repeats and concentrate on holding that image in my mind. 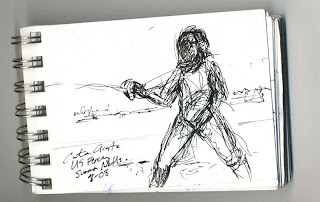 Here's an ink drawing of my daughter as she stands at the ready at her end of the fencing strip. Drawing from life is always fun. Athletes and Dancers move so beautifully that I'm often inspired to draw while at an event. If you'd like to know more about fencing here are some links to the official U.S. Fencing website. The events are free and are in different large cities around the country. The Spanish word sonrisa means smile. And you'll get plenty of smiles when you serve this Sangria at your next get-together. The perfect fiesta drink, this recipe is easy to put together and flexible. Start with an inexpensive red or white wine, add plenty of fruit and some bubbly and you are done. This recipe is light, fruity, and not too sweet. Serve the Sangria in a clear glass pitcher and ladle some of the fruits into the glasses along with the liquid. It's easy to refresh -- just add another bottle of wine along with a bottle of ginger ale and you're good to go for a second batch. One 12 oz. bottle of quality Ginger ale. I use brands with real ginger and sugar instead of corn syrup. Note: wash the outside of the citrus fruit and slice with the skin on. One 20 oz. can of pineapple chunks in their own juice. All ingredients together and serve. You can make this ahead an hour or more, so that the flavors can meld, but it’s not necessary. Note: Red wine will dye the fruits after it sits for an hour or more, so they will not be quite as pretty when served. If that bothers you, put it in an opaque pitcher. White wine maintains the color of the fruits. Fruit options: Also include watermelon and peaches. I don't think apples go well with wine. Experiment with other fruits. Read more about my Hispanic heritage.